My second day at the conference ended up having an extended lunch break, so I used this as an opportunity to go check out a few tourist sites, including walking up the Frankfurter Dom (the cathedral, which has a great view of the city), the Eiserner Steg (“Iron Bridge”, an old pedestrian bridge across the Main), and Sachsenhausen, one of Frankfurt’s neighborhoods known for Apfelweinwirtschafts (basically, cider houses). One of the better known ones is Struwwelpeter, named after the German childrens’ stories by Heinrich Hoffmann (most of which I actually think are more than a little creepy, as childrens’ stories go, like the young boy whose thumbsucking is solved by a tailor cutting off his thumbs with giant shears…). 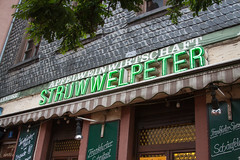 Stepping into Struwwelpeter, you are stepping into a bar that is basically the epitome of a German apfelwein bar. Dark wood. Long benches for eating and drinking. Glass and wrought iron windows. Big racks of “geripptes”, glasses with a lozenge facet cut typically used for drinking apfelwein, as well as giant racks of stoneware jugs (“Bembels”) used for serving up larger quantities of apfelwein. So, I ordered up a gerippte of apfelwein (not my first, admittedly), and sat back to enjoy it over my long lunch hour. 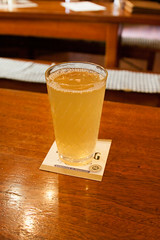 I rather enjoyed the apfelwein, it was crisp and tart, and quite reminiscent of the hard cider I brew myself back in NH. I also decided that Struwwelpeter was a good place to try out some of the other regional specialties, so I decided to give Leberkäse a try. 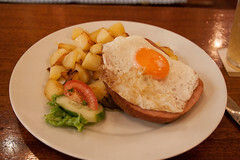 Leberkäse is basically a meatloaf that’s similar to bologna, typically baked until cooked and crispy, then a slice is cut off and sold fried up with an egg. Much like various breakfast creations back in the states made from Taylor Pork Roll, this was actually quite tasty, although not what I’d crave every day. It was a good accompaniment to the apfelwein, however. 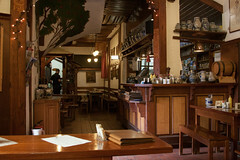 Overall, I rather enjoyed Struwwelpeter, for both the ambiance and the food, it was a pleasant and friendly place for a “schoppen” of apfelwein and a nice German dinner. I wouldn’t hesitate to come back either here, or one of the many other apfelweinwirtschafts of Sachsenhausen.